Notebooks for Peace, a social change project of The Women Worldwide Initiative, aims to provide inspirational, customized composition books (“Notebooks for Peace”) to youth in conflict zones through youth empowerment-focused NGOs. Our target age group is 15 – 25 year olds. Inspired by the Arab Spring, the notebooks allow youth in unstable environments to express themselves and collaborate; they are tools to help youth organize and mobilize. 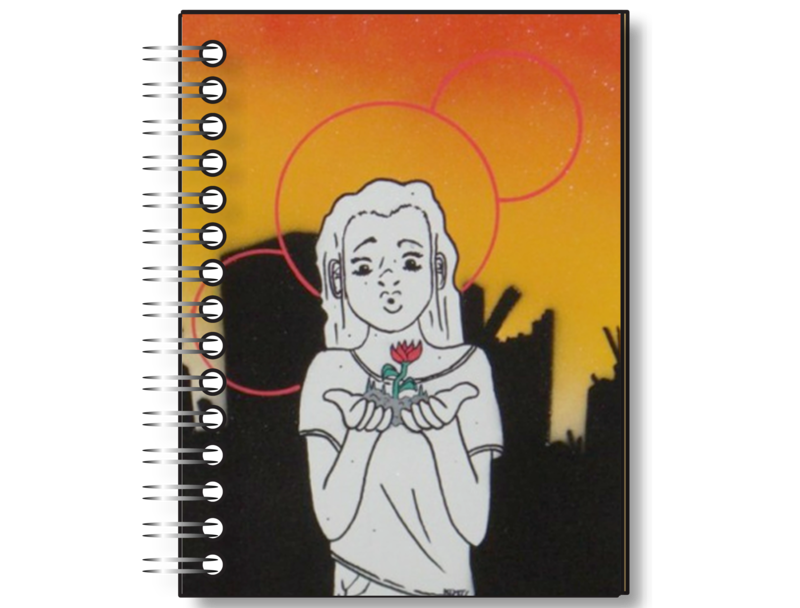 Notebooks for Peace are an outlet for artistic expression and a tool in the struggle for social change and justice. They empower youth and encourage literacy, self-expression and freedom. Each notebook is a gift for a young person in a conflict zone because sometimes they need more than aid – they need inspiration. The notebooks are produced in the destination country in order to provide a boost to their economy. We are working with AMIDEAST, an American nonprofit working in international education in the MENA region. The first shipment of Notebooks for Peace will be shipped to AMIDEAST, where they will distribute the notebooks to youth in the West Bank/Gaza. The success of this project depends on people like you! Each shipment costs between $1,000 – $1,500, and we want to fundraise the entire project through contributions by the global community because we value the message community involvement brings to social change projects. We know that people often need an extra push to donate to a cause, we offer rewards for each pledge of $1 or more! Have a look at our project rewards and donate! While due to the nature of our project, we are most in need of financial donations, we are delighted when our supporters contribute to our efforts by sharing our project with your friends, family and various other networks. Share our link, “like” our page or even tweet a good word about Notebooks for Peace! If you are a youth or education-focused NGO interested in receiving Notebooks for Peace, please fill out a donation request form. Show some love on our IndieGoGo page, where we receive all our donations! Check out our project profile supported by DoSomething.org! Notebooks for Peace falls comfortably in the following categories: community empowerment and development, humanitarian aid, literacy, education, youth empowerment, self-expression, art, social change, social justice, conflict resolution. I love this project! The both of you are such talented individuals with big hearts. I can’t wait to hear about the impact this will have on children’s lives. Thank you so much! This is the kind of encouragement I needed! I will keep you up-to-date on the journey! This is a wonderful, thoughtful idea! Why not also explore printing, binding and distributing the notebooks in the West Bank (I’m not sure how possible it is to do that in Gaza in terms of their supplies) instead of shipping the books there and maybe having to deal with Israeli customs? Manufacturing the notebooks there will help stimulate their economy and provide jobs – even if just on a per project basis – on top of giving the youths awesome gifts. There is also the possiblity that some of the notebooks, once their pages are filled, will stand out as pieces of art work. An auction can be held (with the permission of the artists, of course) and the profits can be split 50-50 with half going towards manufacturing more notebooks for youths in another conflict zone gifts from TWWI and the artists. We agree, it would be wonderful to stimulate their economy, and we are currently looking into possibilities of producing the notebooks in the WB. We are working with AMIDEAST, an American nonprofit in the WB/Gaza, and so customs will not be an issue.